I have a feeling that many of those who bought 4600 meals at Roland Garros restaurant over fortnight have similar motivation. During the matches (which are scattered across 11 clay courts), almost as many people are roaming in the tennis village as there are at the tribunes. Nevertheless, the tribunes are normally full and enthusiastic, with here and there first-name cheers for the players and football tunes. Here are some of my captures this season. From the elite event it was originally designed to be, Roland Garros is getting more and more democratic every year. Apart from the tickets by invite and game tickets for every of the courts, there is also, as I learnt this weekend, a village pass. The pass gives an entry right to the territory of the sport complex, where an eager sports fan (or a beginning socialite) can either watch the games’ projections on large screens or chase a kind soul leaving the stadium for the day and willing to give his ticket away. French are the masters of details. 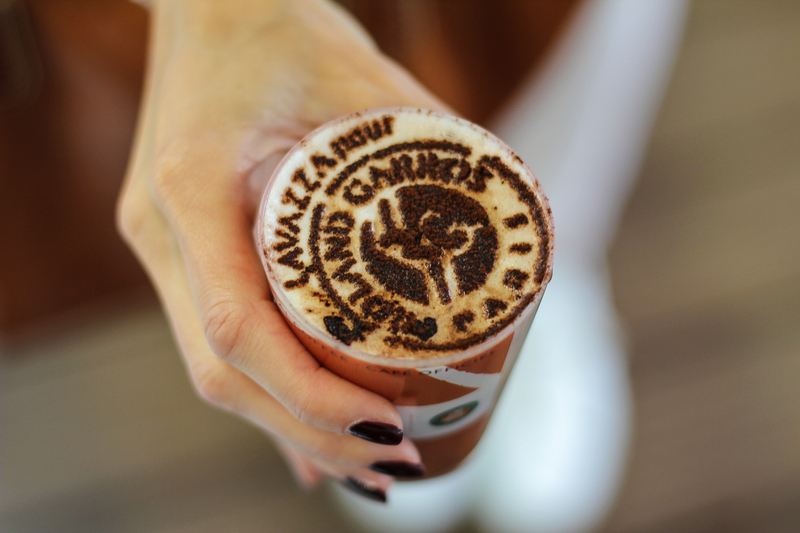 If you got fascinated by the Roland Garros coffee on the featured picture of this post as much as we did, here it the chef-d’oeuvre in the making. And, of course, our seasonal pictures. If you made it to this point in the post, that’s probably because the jacket and the jewelry on my photos lured you all the way. I am not a fashion blogger and I could never be one, largely because I tend to wear very simple things with minimum details in maximum two colors (one of them black or grey) at a time and to shop for them a few times a year (preferably online). I am a girl who buys a T-shirt she likes in all available (mono) colors just because she has finally found something simple enough. However, my limited experience of a shopper proves that the simplest things are the most difficult to find. I have been looking for a perfect leather jacket for years and found this one at Biljana Tipsarevic after I returned another parcel of around-1k-goodies to YOOX. To my delight, Biljana is a designer from Serbia (I love finding great things about my area of origin and brag about them). And she agreed to make the jacket I loved with silver zippers instead of the default gold ones. What can I say, no one knows how to dress a Slavic girl better than a Slavic designer! For literally the first time in my life I found a hard skin leather jacket which was a perfect fit, not too short and with the waist where the waist is supposed to be. I will for sure return for more. Check out Biljana’s collections, they are fabulous. The second of my trophies is the orchid jewelry set from the Russian brand Aldzena (Альдзена). I had the bracelet made to fit and bought it through the online shop Evora.ru together with the earrings (mainly because it is virtually impossible to order something at Aldzena directly without living in Russia). Now you also know a lot about tennis. Until next year, Roland Garros! Hehe, we have barely escaped the rain as well, it started once we were leaving. And last year we did not escape it at all and had lunch outside of the stadium waiting for the games to resume :)) it’s the company that matters! I became pretty pleased to locate this kind of web-site.I want to to great moment for this fantastic examine!! My partner and i definitely taking pleasure in every single little this i have you saved to view brand new items you article.